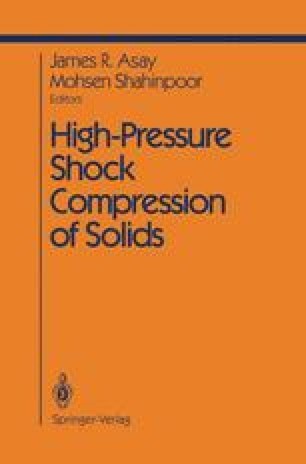 The use of plane shock waves to determine the equations of state of condensed materials to very high pressure began in 1955 with the classic papers of Walsh and Christian (1955) and Bancroft et al. (1956). Walsh and Christian described the use of in-contact explosives to determine dynamic pressure– volume relations for metals and compare these to the then available static compression data. Bancroft et al. described the first polymorphic phase change discovered in a solid, via shock waves—iron. Two years later Soviet workers (Al’tshuler et al., 1958) reported the first data for iron to pressures of several million bars (megabars) actually exceeding the pressure conditions within the center of the Earth. Since that time the equations of state of virtually hundreds of condensed materials have been studied, including elements, compounds, alloys, rocks and minerals, polymers, fluids, and porous media. These studies have employed both conventional and nuclear explosive sources, as well as impactors launched with a range of guns to speeds of approximately 10 km/s. Recently, Avrorin et al. (1986) have reported shock-compression data in lead to a record pressure of 550 Mbar.